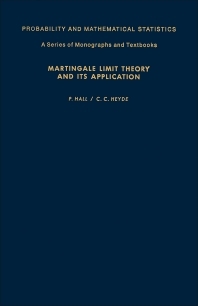 Martingale Limit Theory and Its Application discusses the asymptotic properties of martingales, particularly as regards key prototype of probabilistic behavior that has wide applications. The book explains the thesis that martingale theory is central to probability theory, and also examines the relationships between martingales and processes embeddable in or approximated by Brownian motion. The text reviews the martingale convergence theorem, the classical limit theory and analogs, and the martingale limit theorems viewed as the rate of convergence results in the martingale convergence theorem. The book explains the square function inequalities, weak law of large numbers, as well as the strong law of large numbers. The text discusses the reverse martingales, martingale tail sums, the invariance principles in the central limit theorem, and also the law of the iterated logarithm. The book investigates the limit theory for stationary processes via corresponding results for approximating martingales and the estimation of parameters from stochastic processes. The text can be profitably used as a reference for mathematicians, advanced students, and professors of higher mathematics or statistics.